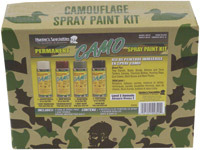 Camo Spray Paint Kit includes four 12 oz. net weight cans of permanent spray paint, leaf stencil and instruction sheet. Colors: March Grass (Tan), Mud Brown, Flat Black and Olive Drab. Price $26.99 each Paint tree stands, boats, or blinds with 12 oz. net wgt. cans of permanent camo spray paint. Price $5.69 each Paint tree stands, boats, or blinds with 12 oz. net wgt. cans of permanent camo spray paint. Paint tree stands, boats, or blinds with 12 oz. net wgt. cans of permanent camo spray paint.